Is D.C. Ready for Electric Vehicles? 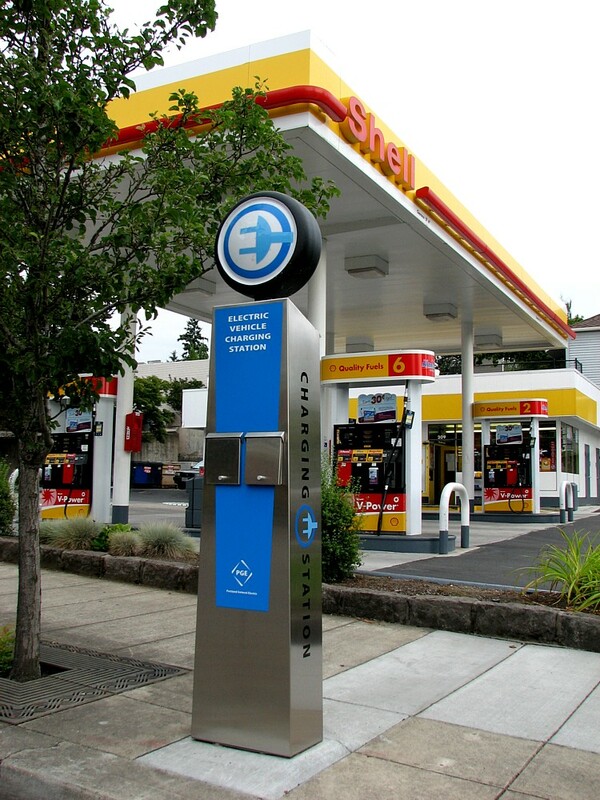 If D.C. is going to be ready for the arrival of electric cars later this year, it's going to have to begin installing more public charging stations, like this one in Oregon. Photo: Todd Mecklem, flickr. They’ve been all over the news lately – the Chevrolet Volt, the Nissan Leaf, the Tesla Roadster. And they’re coming soon: Electric vehicles are expected to hit the streets late this year. If they make the splash automakers and sustainable transport advocates hope they will, they could change our world. Nissan’s President and CEO predicts that 10% of cars sold by 2020 will be electric vehicles, and 56,000 Americans have already pre-ordered the Leaf. The success or failure of electric cars does not depend solely on working out the kinks with the cars themselves. Cities will play a major role in determining how far this technology goes. The municipal level is where two critical issues will be resolved: 1) the reinforcement of the local electric grid and, 2) the development of charging infrastructure. Without effective action on these fronts, electric cars will be basically unusable. These issues are particularly pressing in D.C. Our hometown is one of the three initial launch markets for the Chevy Volt, which will be cruising down Pennsylvania Avenue by November or December. How electric vehicles are received in Washington, which is not only a test market but also the place where they’ll be experienced by our country’s decision makers, will set the stage for their reception all over the country. Unfortunately, it doesn’t seem like much is happening in Washington at this time. The D.C. government has talked about charging stations, but is waiting for more information from the private sector after issuing a request for information, whose deadline was in February. Pepco has unveiled two charging stations in its own garage and will open eight more across its service areas in D.C., Maryland, Delaware and southern New Jersey later this year. Smart meters and smart grid technologies will be incorporated into the stations to collect information about energy consumption. The company also purchased 10 Volts that will be driven by employees as part of a two-year demonstration project to assess the impact of these vehicles on the electric system. Additionally, a few private businesses have purchased charging stations for installation in their parking garages this summer. It’s a positive sign that the D.C. government and its partners are taking at least some action, and it’s important to collect information. However, in comparison to the progress being made by other city governments, these steps seem to fall short of what’s needed, and are moving very slowly considering electric vehicles will be hitting our streets in as little as eight months. For instance, Seattle, one of the test markets for the Nissan Leaf, plans to install 2,500 public charging stations this year and is working with utilities to find optimum locations. San Francisco hopes to have 60 charging stations installed in public garages by year end, with a thousand more available across the Bay Area in 2011. General Motors Corp. believes that most Volt owners will charge their vehicles at home or at the workplace, and some cities are exploring how to streamline the bureaucracy owners will need to work through to install private charging stations. For example, San Francisco is revising building codes to require that new structures be wired for car chargers. Officials in other cities are also tackling concerns about the overloading of the electrical grid that could come with large-scale adoption of electric vehicle technologies. With a single car consuming three times as much electricity as a typical home, there could be a danger of neighborhood blackouts. In response to this worry, Pacific Gas and Electric executives are preparing “heat maps” of neighborhoods that they fear may overload the power grid with their widespread use of electric cars. The utility is also leading a large-scale “smart charging” pilot project later this year where it will connect 200 cars to special charging stations that let utilities control the electrical demand at any given moment. Additionally, some utilities are taking action to educate consumers about how and when to charge their electric vehicle. Perhaps spurred on by all of this action, companies in other cities are investing in electric vehicle technology, as well. The Adobe headquarters in San Jose has a dozen charging stations in the parking garage and 18 more coming this year, and the parking lot of Google headquarters already has 100 charging stations. With so much riding on the effective implementation of electric vehicle infrastructure, the D.C. government should begin implementation soon, perhaps in partnership with Maryland’s new Electric Vehicle Infrastructure Program.